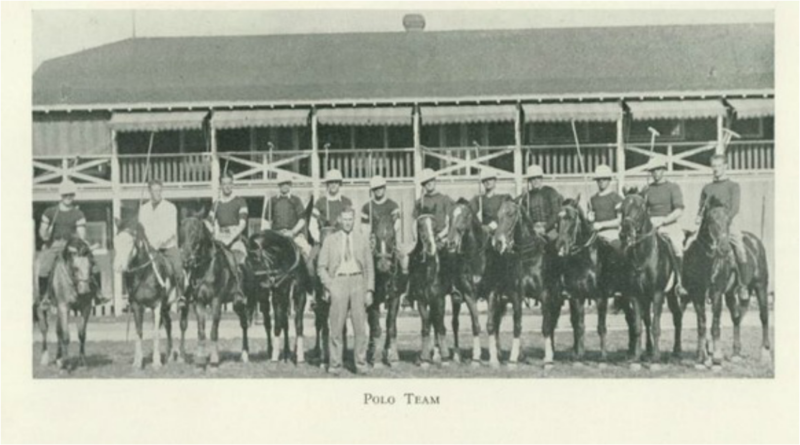 USC's polo tradition started and flourished during the 1930's and 40's. In 1934, a group of USC students formed the first USC Polo Team. Their very first match was against the talented Walt Disney Mickey Mouse team, and they triumphed 7 to 6. 1934 also saw the formation of the first USC Women's Polo Team, with three sisters of the Alpha Chi Omega Sorority emerging as the top players. Between 1934 and 1941, USC took the Pacific Coast title three times. Unfortunately, World War II caused USC polo to become dormant for 40 years. It took the vision of Montgomery Fisher, Al Garcia and Suzanne Peika to bring the sport back to the USC campus in 1983. The USC Polo Club was formed under, and is supported by, USC's Recreational Club Council. USC's return to polo was initially seen in the form of a women's team, starring two sisters of Alpha Chi Omega, Kristen Columbo and Lisa Lebold. They were coached by 5-goal pro Tony Lukashevich, and participated in the National Women's Collegiate Polo Tournament that very first year. The following September, Don Gray, then a sophomore, reestablished the Men's Polo team. The first year out, the Trojan men participated in the U.S. Nationals. The Trojans have since reached national-level competition on several occasions, and three of its women, Tristen Weltner, Cindy Stephenson, and Kate Schein have reached All-American and All-West status. From the Men's team Bill Hoyman, Kit Steven and Himmat Singh achieved All-West all-stars in three consecutive years and Himmat Singh was also named All-American at the National Championships. In 2003 the USC Men's Polo Team was victorious over a very talented team in an extremely well fought-out game to win the Western Regional Championships and travel to Brushy Creek Texas for the National Championships. Furthermore, in the 2003 season, USC had two of its players considered by the USPA for the Collegiate Polo MVP award. From 1983 to 1989 the club and teams carried out their activities at the Los Angeles Equestrian Center under the direction and support of Tom Goodspeed, Joe Henderson, Dan Healy, Tony Lukashevich, Ed Metz, Vince Azzaro, Bruce Gaither, Don Gray, Tristen Weltner, Stormie and Sue Sally Hale and Andres Huertas. From 1990 to 1998, Trojan polo found support at the Beach Cities Polo Club, at Moorpark Polo Club, and at the L.A. Riding and Polo Club. From the fall season of 1998 to the spring season of 2003, USC's home was the California Polo Club in Lakeview Terrace. In the fall of 2003, the USC polo club moved to the Fair Hills Polo Club in Topanga Canyon. Since the fall of 2000, Ardeshir Radpour, a former USC polo player and rider of Traveler (USC's famous mascot) has been the Head Coach. A great deal of advice and donations of ponies and tack was provided by many people including Alex & Betty Haagen, III, Michael Brones, J. Allen Ramey, Willis Allen, Howard Wilson, Tim Walt, Sean MacLeod, Suzanne Peika. A great deal of motivation and support was provided by Danny Scheraga and by George Alexander from the Polo Training Foundation. In the Fall of 1985, the Pacific Coast Intercollegiate Polo Conference was formed, to include five Universities: Stanford, UC Davis, Cal Poly San Luis Obispo, and USC. Moorpark College, Santa Barbara City College, Oregon State, Washington State and Westmont College have joined since. The teams participate actively in the Western Regional Intercollegiate Polo Tournament, leading to the National Tournament sponsored by the United States Polo Association (USPA) every spring.